I'm looking for pictures of the Astor's private car, the Oceanic. Any help would be appreciated! Perhaps some context would be nice for those of us sitting on the sidelines scratching our heads. Who was "Astor"? What was his significance? What is special about the car in question? John Jacob Astor IV wealthy investor died on the Titanic. Sorry I should have added more background, but wow I didn't know it still existed, thanks!! Does anyone have any pics of it service? Last edited by sandiapaul on Tue Apr 02, 2019 6:11 am, edited 1 time in total. I would suspect that this car was used by Vincent Astor following his father's death. Vincent also had built a private hobby railroad on the Ferncliff estate (unknown gauge), though I have not found any details about the line. He later built a private 18" gauge railroad on Bermuda which featured a Davenport 2-6-2, several cars, and a battery-electric motor car. The locomotive survives in decrepit condition today. Some tracks and the battery motor car were seen surviving into the 1990s (which is another Astor's private car). This little railroad operated for a time in the 1960s and possibly early 1970s as a tourist railroad by a subsequent land owner. For the Oceanic, here is an "in service" photo, of a sort. It looks like a service for 8. Is there a history of the car available? (Builder, build date, any significant modifications (steel underframe maybe) date out of service? There appears to be a second car included within the restaurant... is that car identified? 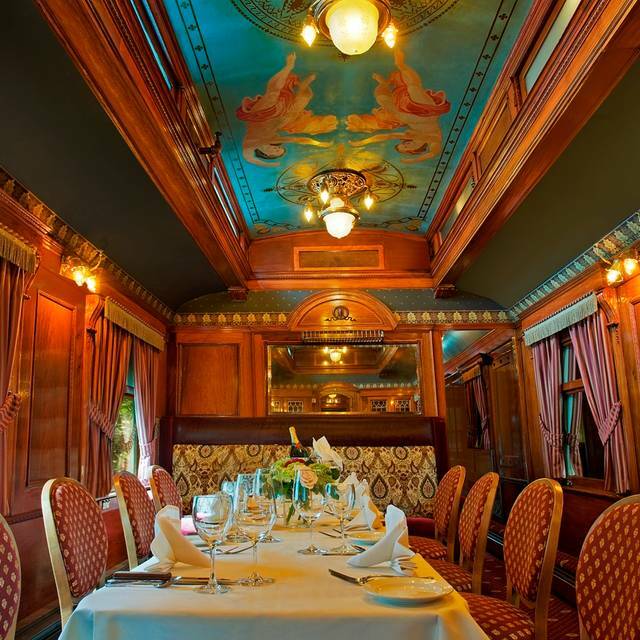 As to the second car, according to the 1980 Private Passenger Car Annual it is the "Admetus", ex Live Oak, Perry & Gulf lounge-observation, ex Southern, ex Pullman, built by PCW around 1907. There is no data for the "Oceanic" other than it was an ex P&WV business car. History: Built by Pullman (plan 2429, lot 3701). Consigned to Daniel C. Jackling 19 July 1909. Builder’s photos dated 20 July 1909. Sold to Julius Fleischmann in 1920 and renamed Middleneck. After his death (05 Feb 1925), sold by the Fleischmann Transportation Co. to the Pittsburgh & West Virginia Railway as office car No. 200 Hopedale, and on their roster through the 1950s. I'll have to do a little more digging for more details - it's not at my fingertips at the moment. The cars were for sale for a while and may still be. I would suspect that this car was used by Vincent Astor following his father's death. Vincent also had built a private hobby railroad on the Ferncliff estate (unknown gauge), though I have not found any details about the line. Vincent Astor’s line at his Ferncliff estate was 3 - 1/2” gauge live steam. It was built and maintained by Calvert Holt of Greenwich, Connecticut. The equipment was lettered with the unfortunate name “Toonerville.” In later years the equipment was maintained by George Murray of Manchester, Connecticut after Mr. Holt’s untimely death. Attached is a photo of Calvert Holt running Vincent Astor’s locomotive at Ferncliff. The car is said to have been halfway through Maine, heading towards Halifax, when word came that Astor's corpse had been found. The body was heavily ingrained with soot and crushed, evidently happening when one of the ship's funnels collapsed. Astor was identified by the contents of his pockets, which included $10,000 in cash. Does anyone know when the restaurant got the Oceanic? It looks like it has trucks and is on rails, but its hard to tell from Google streetview, the other car is very visible. I had the pleasure of meeting Rod Keller and his son, Bob, on a couple of occasions many years ago and have dined on the car used for food service several times. Both cars are butted up against the main building and do not have any doorways cut into the sides. There have been some modifications to the interiors, the biggest being removal of the kitchens which were converted into dining areas. Both are on track panels on their trucks and I believe the diaphragms are also still intact. At one time, the Kellers had another restaurant in West Orange, N.J., called The Essex House which also has a PV there. The current owners tried to sell the car about ten years ago but thought they had something akin to the Hope Diamond and wanted a small fortune for it. I put them in touch with Linn Moedinger at the Strasburg RR but they could not come to terms. The car is again used for dining but not on the level the Kellers were noted for. The coupler and draftgear on the blunt end are missing. Rod also bought two other PV's, Florida East Coast No. 97 and Atlanta & West Point No. 100 which were stored on the Morristown & Erie RR for years while I worked there pending movement to another planned restaurant that never materialized. Both were eventually sold and restored from what I have heard.